AppAudioConfig displays the current audio settings for every application on your system and allows you to easily change multiple application settings at once. You can change a variety of functions including volume, right/left audio balance and mute/unmute status. How to extract: Download the ZIP package and extract to a folder of your choice. Launch AppAudioConfig.exe. /cfg command-line option to start AppAudioConfig with the specified config file. SoundVolumeView displays general information and current volume level for all active sound components on your system, allowing instant mute/unmute. This is useful both for viewing audio management details as well as tracking down (and silencing) a given program sound from your system. Additionally, the program also allows for loading or saving custom sound configurations for a given situation or toolset. A config file contains volume level, mute/unmute state of all sound components and default sound devices. A command-line interface is also available with extensive support, allowing you to save/load profiles, change the current volume of every sound component and mute/unmute every sound component. How to extract: Download the ZIP package and extract to a folder of your choice. Launch SoundVolumeView.exe. Added new command-line options: /SetListenToThisDevice, /SetPlaybackThroughDevice, /RunAsAdmin. @ bzl333: System Requirements: This utility works on Windows Vista, Windows 7, Windows 8, and Windows 2008. Both 32-bit and 64-bit systems are supported. Another great product from Nirsoft... Keep em comin. sLyrics allows the search and download of song lyrics from a broad database of songs. The program also allows search inside lyric text. The program uses the ChartLyrics API. How to extract: Download the ZIP package and extract to a folder of your choice. Launch sLyrics.exe. Small tweaks now that the API is back online. ChordEase makes it easier to play music with complicated chords. No matter what the chords are, you can play as if they were all in the key of C. You don't need to play sharps or flats, because ChordEase automatically adds them for you. Although ChordEase is primarily intended for jazz, it could be useful for any type of music that modulates frequently. ChordEase alters your notes in real time in order to make them harmonically correct, while preserving their rhythm and dynamics. By delegating rapid music theory calculations to ChordEase, you gain freedom to concentrate on other aspects of musical performance, such as feel and aesthetics. 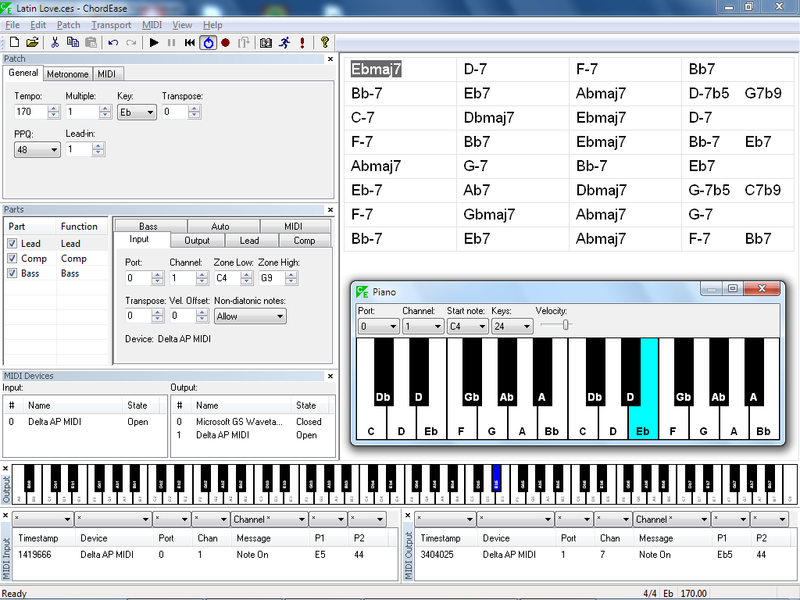 The program is a translator that takes MIDI notes as input, and produces MIDI notes as output. The input notes are translated to the current chord scale, so that the output notes fit the chord progression of a song. Supports various mapping functions which determine how the translating is done, can handle multiple translations at once for multiple performers to play through a single instance using any number of MIDI instruments. Parameters can be remotely controlled via MIDI for additional effects and can also record its own output as MIDI data. How to extract: Download the "Portable" ZIP package and extract to a folder of your choice. Launch ChordEase.exe. Nice proggie! For Music lovers is a "must have"
Why this program is signed as "NO STEALTH"? That "NO STEALTH" setting is because I created the database entry myself. I tried pretty hard to get it right but apparently not quite. What should it be?